I love this sentiment. It could work for so many different occasions and almost every little girl and women that I know. 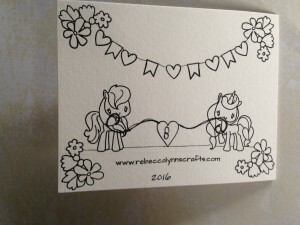 Extra Details: I started by stamping and coloring the pony images from Simon Says Stamp and The Greeting Farm’s Mini Pony Party. I used colored pencils to color everything in. After coloring, I fussy cut all the images out. I can see now that I forgot to paint the edges of my images with a black marker. 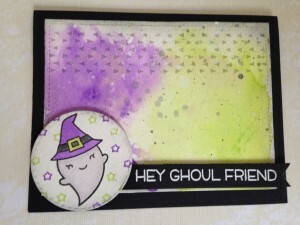 I also used the gift box from Simon Says Stamp and Lawn Fawn’s Happy Howlidays. I die cut a rectangular panel from water color paper. I also see that I have a score line in the middle of my panel that I didn’t notice as much in real life. I added some color to the background panel with Distress Inks. I did create a mask so I could separate the ground and sky, but the line is covered up by the ponies. Next, I began adhering the images. Everything is glued flat to the inked panel. I stamped my sentiment next. 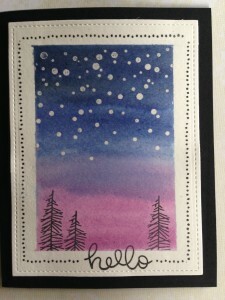 I used colored inks to add some stars around the sentiment. Lastly, I adhered the box top. I added the panel to a kraft card base and was done. 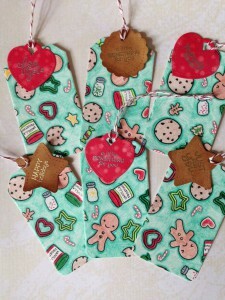 I had a tiny strip of the patterned paper I used to create the cookie Christmas tags (Christmas Tags 2.10) that I couldn’t bear to throw away. I used it to create this card. Extra Details: I started with a white standard sized A2 card base. 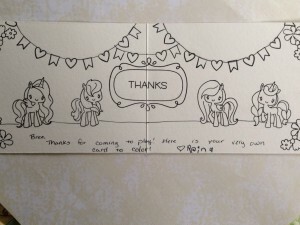 I attached my small strip of patterned paper to the bottom edge of the card base. Next I die cut a rectangular frame from some kraft card stock. I added some wood grain stamping to the frame for interest. I adhered the frame to the card base. 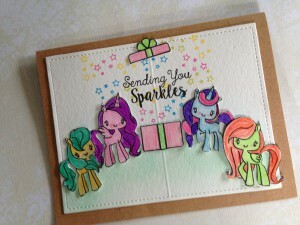 I had stamped and colored the images from the Sprinkled with Love stamp set when I first bought it. I raided my stash of pre colored and cut images to create the grouping in the middle. I added some blue Distress Ink with a foam blending tool and then adhered everything as flat as possible. 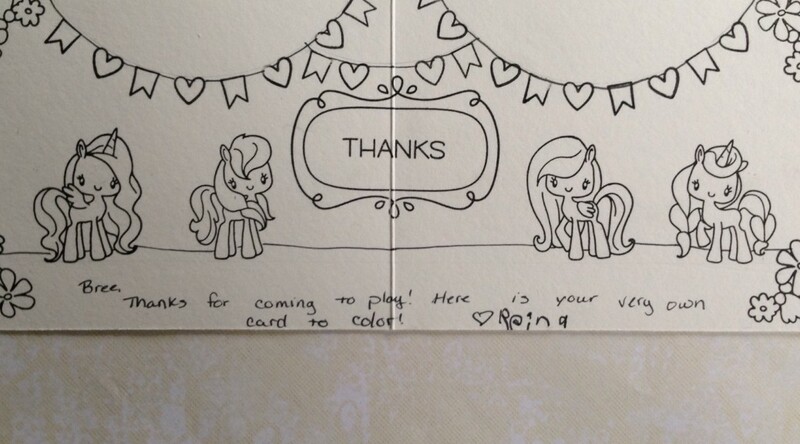 Lastly, I added the sentiment and the card was finished. I had a tiny strip of the patterned paper I used to create the pine branch Christmas tags (Christmas Tags 2.9) that I couldn’t bear to throw away. I used it to create this card. 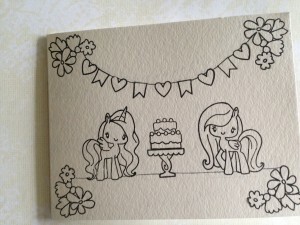 Extra Details: I started with a white standard sized A2 card base. I attached my small strip of patterned paper to the bottom edge of the card base. Next I die cut a rectangular frame from some kraft card stock. I added some wood grain stamping to the frame for interest. Using a pencil I carefully marked the inside edges of the frame on my card base. 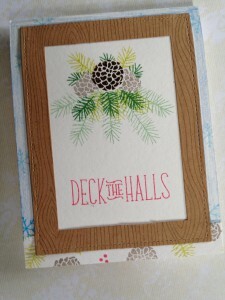 Using the markings as a guide I stamped the cluster of pine cones and pine branches directly on the card base. I only masked the pine cones. I used some second generation stamping to create a lighter green shade. I added the sentiment next. Before I adhered the frame, I added some light blue snowflakes to the edges of the card base. Then, I adhered the frame. I thought that the card was still missing something, so I colored the edges of the card base with a light blue colored pencil. I’m not sure that I love the results. Ink: Memento Dew Drops in Bahama Blue, Pear Tart, Lady Bug, Rich Cocoa, and Cottage Ivy. What to do when you can’t sleep? Look at old Lawn Fawn Blog post for inspiration of course. Late one night last week, I found Lizzy’s video from October of 2014. 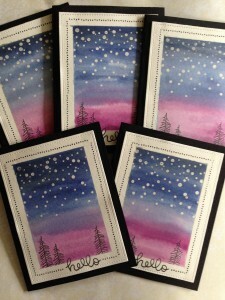 She created two sets of cards with water color backgrounds. The part that inspired me the most was the use of the pine branches from Deck the Halls as trees. I love her results so much I decided to make my own set of cards. Extra Details: I started by die cutting five stitched rectangles form some water color paper. Using Post It tape, I masked off the edges of each piece. I stamped and heat embossing the falling snow from the Snow Cool stamp set. I used clear embossing powder. I added the trees in black ink along the bottom at this point also. Then I began water coloring. I used three shades of Distress Inks; Black Soot, Chipped Sapphire, and Seedless Preserves. I added a few layer of color before I got the effect I was looking for. After the ink was dry, I peeled off the Post It tape and finished my stamping. I added the sentiment first and used a border stamp from the Deck the Hall stamp set for the edging. I adhered each panel to a black card base and was finished. 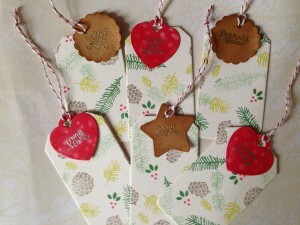 I am really enjoying making Christmas Tags this year. They are just small little things that I can experiment on and play with. Also, I bought a lot of fun holiday themed stamped sets this year. I played with colored pencils and kraft paper today. 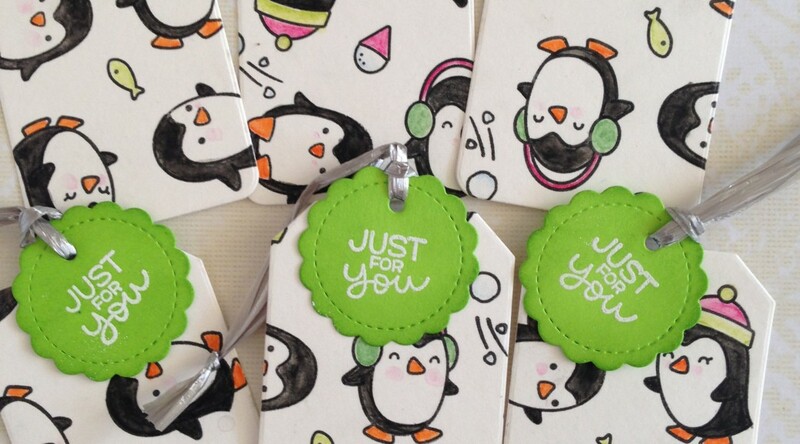 Extra Details: I started with half a sheet of kraft card stock for these tags. I think it measured 4.25” x 11”. I stamped the adorable deer from Lawn Fawn’s Toboggan Together and Cheery Christmas all over the paper in brown ink. I added the string of lights to one of the deer and filled in the empty spaces with some small snowflakes. Using white, a light brown, a medium brown, and a light pink, I colored all of the images in. I am just amazed at how beautiful the coloring turned out. 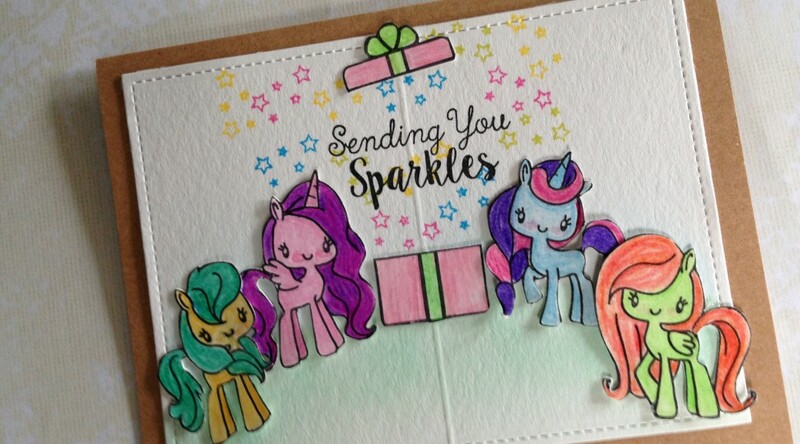 Using some cheap gel pens I found at target, I added some metallic accents to the tags. I added gold to the snowflakes and the Christmas lights. I added silver to the snowflakes. I also added some gold and silver dots to the background. Once the gel ink was dry, I die cut some tag shapes. I was only able to get five from this size of paper. 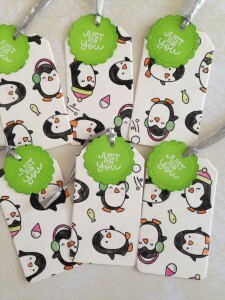 I found some dotted vellum in my stash and decided to use that for the mini tags. I gold embossed a sentiment on each of the vellum tags. 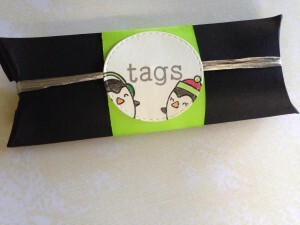 I used natural twine to tie a mini tag to a larger tag and they were done. Extra Details: This card was pretty easy to make. We stamped everything in black ink, used a thin black sharpie to fill in anything that needed to be filled in and the card was done. Extra Details: I started with half a sheet of water color paper and stamped the penguin images all over it. I added a few smaller images to fill in the black areas. I used water color pencils and a cheap water brush to add the color. I used mostly two shades of green, red, and black. I added some orange for the beaks and feet. I also used a very light blue and light pink for the snow cones, snow balls, and cheeks. Once the water color was dry, I die cut six tag shapes. I cut the smaller tag from some light green card stock. I inked the edges with Mowed Lawn Distress Ink for interest. I embossed the sentiment with white embossing powder. I tied the two sizes of tags together with some silver raffia. To make the pillow box, I used the We R Memory Keepers Pillow Box Board. I started with a strip of black card stock that measured 6” x 7.5” and created a pillow box. I die cut a stitched circle and decorated it with two penguins. I heat embossed the word “tags” in silver. I added a strip of green card stock and tied the box closed with some silver raffia. I adhered the stitched circle over the top of the green card stock and silver raffia to finish off the box. Once I had finished my Deck the Halls patterned paper tags, I started looking through my stamps to see what other types of patterned paper I could create. 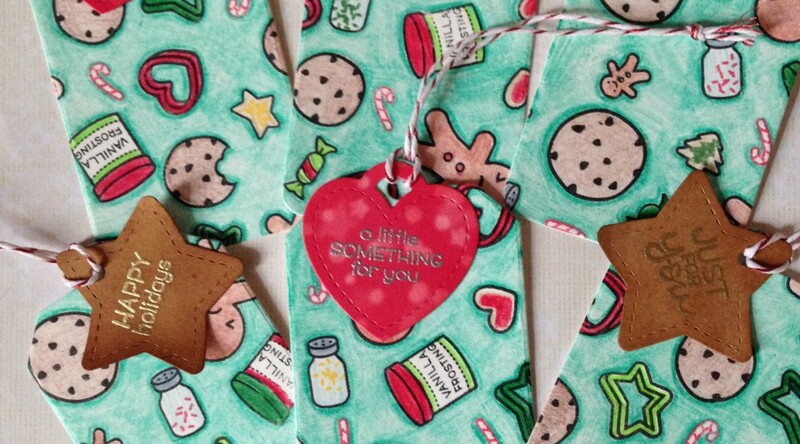 I own a number of the baking related stamp sets, so I decided to make a set of cookie themed tags. Extra Details: I started with a half sheet of water color paper. 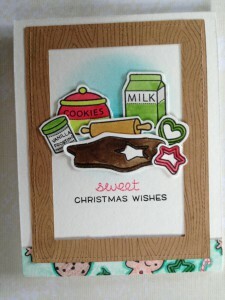 Using the images from Sprinkled with Joy, Milk and Cookies, Oh Snap, and Smart Cookie, I created my own patterned paper. 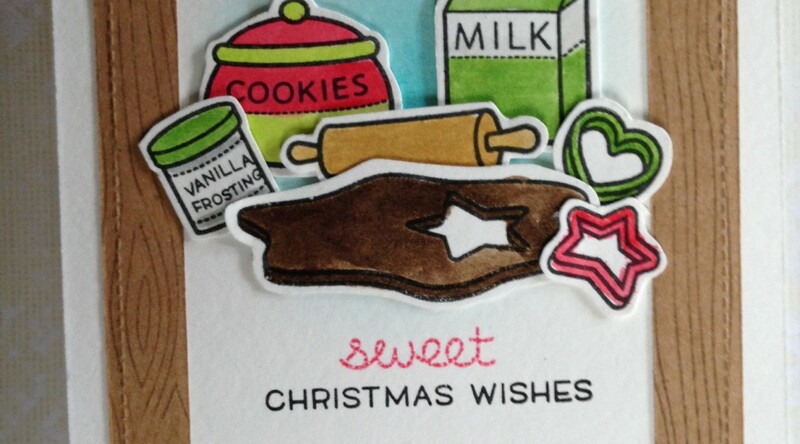 Once all of the images were stamped, I stamped the solid images in colored inks: such as the frosting on the cut out cookies, the chips in the middle of the chocolate chip cookies, sprinkles in the jar and the candy canes. Then, I die cut the patterned paper into tags. I was able to get 6 tags from the half sheet of water color paper. I didn’t want to cover up too much of my patterned paper, so I decided to add a Tiny Tag to hold the sentiment. I cut some Tiny Tags from red patterned paper and some from kraft card stock. 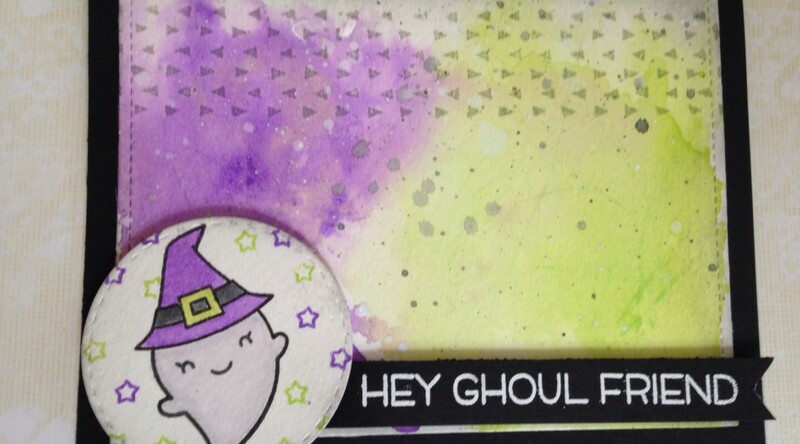 I used the Tiny Tag Sayings stamp set for the sentiments. 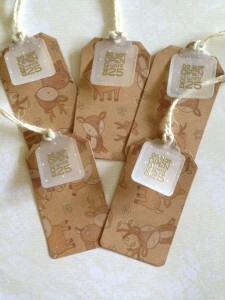 I used silver embossing powder on the red tags and gold embossing powder on the kraft tags. 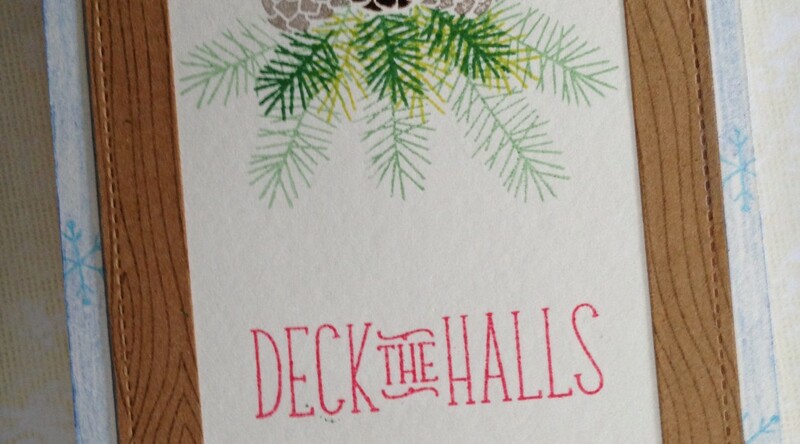 After the embossing powder was cooled, I added some ink blending to the Tiny Tag die cuts. 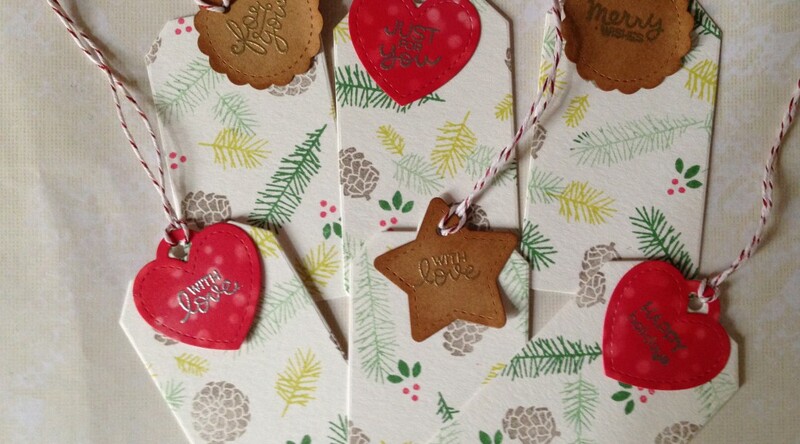 The red tags needed it to help dull the white in the patterned paper and help the sentiments stand out more. After I inked the red tags, the kraft tags looked really boring, so I added some ink to them also. Lastly, I added some Red Sparkle Lawn Trimmings to the tags. 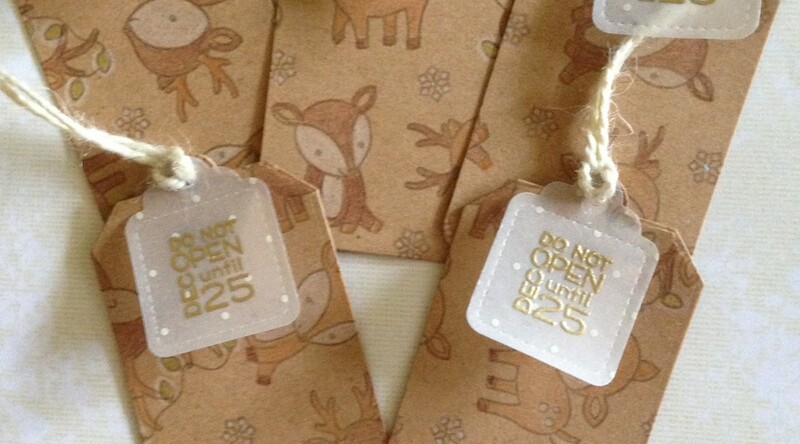 The Tiny Tag die cuts are not glued to the big tags in any way, they are only held together by the twine. Extra Details: I started with a half sheet of water color paper. 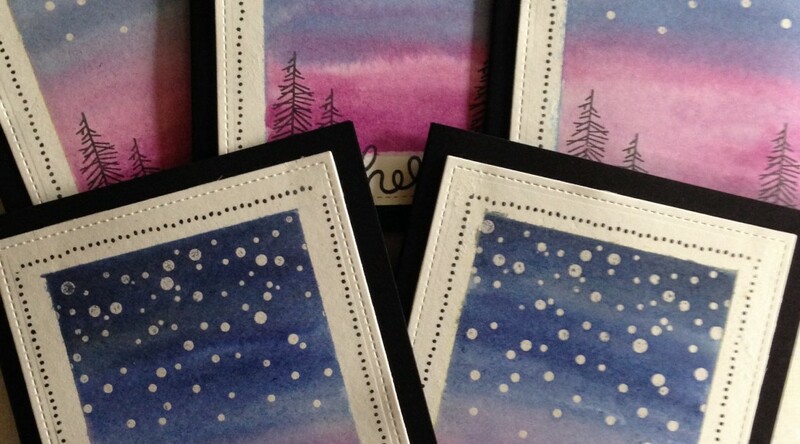 Using the images from Deck the Halls stamp set, I created some patterned paper. I used two shades of green, a brown, and a red. I used second generation stamping with the darker green ink. Once the ink was dry, I die cut the paper with the Tag You’re It die. I was able to get 6 tags from the half sheet.